Complete, including a Lovely back-cover ad for dresses! (Maybe they should have tried selling Sheena costumes). Now (Sep 2014) with new bigger&better scans. Comment: And thanks a whole bunch for your supply of bikini-clad jungle girls! Cover (1 page) The Banshees of Voodoo Veldt! Comic Story (10 pages) The Banshees of Voodoo Veldt! Synopsis: Treasure hunters persuade the Bathongas that Trader Thompson has taken their children as slaves. The Bathonga warrior leave their village in pursuit of Thompson. Meanwhile, the treasure hunters loot the Bathongas' treasures. Kaänga and the innocent Thompson expose the thieves and turn them over the district commissioner. Credits: Script: ? [as Frank Riddell] | Pencils: Maurice Whitman | Inks: Maurice Whitmann?; ? Synopsis: An airplane, bearing the circus lion Cusco and his trainer, crashes in Simba's jungle. 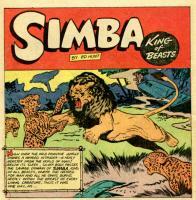 Simba fends off an attack by a leopard and takes the newly freed Cusco under his tutelage. Cusco's trainer spies Simba and, believing him to be Simba, has him shot with a drugged dart. While Simba is at the trainer's camp, recovering, Cusco is forced to fight a pack of leopards. Simba recovers and rescues Cusco at the last moment. He then escorts the tame lion back to his trainer. Synopsis: Animals of the World from A to Z, this features creatures beginning with "B". Synopsis: Terry is relieved of his command for failing to capture the bandit Al Raschid. When his replacement sends word that he has cornered the bandit and needs ammunition, Terry suspects that Al Raschid is arranging a trap. Terry and Keeto rig the ammunition cases with smoke grenades and allow the bandit's men to take the supplies. 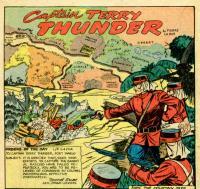 When the cases are opened and the bandit and his men are blinded, Terry and the handful of lancer loyal to him, capture them. Terry's command is restored and his given a commendation. 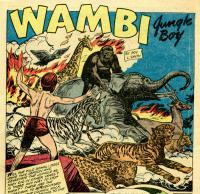 Synopsis: Wambi accidentally starts a small fire with a magnifying glass and his jungle friends all shun him. But when the gohali dogs attack, Wambi leads them into oil-polluted waters and ignites the oil with his magnifying glass. He is forgiven by his jungle friends for his earlier mistake. Synopsis: Zan dispatches Tabu to capture the witch Langa. Tabu complies and makes the Swahilis believe that she has been taken by her evil gods. Synopsis: Treasure hunters bent on looting a lion cult's temple, set explosive charges that they believe have killed the district mines inspector. The inspector and his assistant blame the blast on Camilla. Camilla convinces them that she is innocent and the three of them confront and defeat the treasure hunters who are killed by the cultists.